Nashville locals Jeremy Dickens (logickal) and Tony Youngblood were on-site this month for CDM to cover the Nashville’s NAMM show, the summer installment of the major music manufacturer trade show. The Summer 2010 edition of the North American Music Merchants trade show (Summer NAMM to most of us) has come and gone. For three days in humid downtown Nashville, members of the gear manufacturing, distribution, and retailing businesses converged upon the convention center to see the latest new merchandise being brought to market. This year, however, they did so against the backdrop of a city whose economy faces an uncertain future in the wake of the devastating flooding that displaced thousands of people and did billions of dollars in property damage. See NAMM’s press release for numbers and a slightly different angle. -Ed. Meanwhile, many of the attendees were disappointed by the lack of representation from some of the bigger names in the industry. Gone are the days of an Ableton, once distributed by M-Audio, announcing new versions of Live on Saturday Morning; that company, like many others, reserves the honor exclusively for events like Anaheim’s Winter NAMM show. Indeed, M-Audio and their new parents Avid were easy to miss in the crowd, having a small display of product and scheduled Pro Tools demos hidden among the racks of Hal Leonard Publishing’s music books. The show that once sprawled across two floors of the Nashville Convention Center and the adjacent arena now fit almost entirely within the confines of the Center’s main exhibit hall. Even with Summer NAMM’s well-deserved reputation as a “guitar show,” the larger guitar manufacturers were conspicuous in their absence. 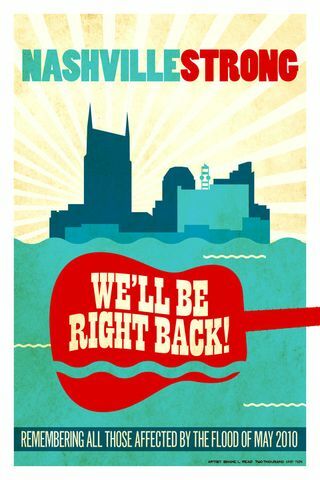 That being said, Nashville’s participation in the yearly NAMM schedule is an important one for other reasons. The influx of travelling convention participants is something the local economy counts on for tax dollars — now more than ever. The city’s other main convention center, Gaylord Opryland Hotel, is closed until November after sustaining heavy flood damage, causing the cancellation or relocation of many events previously booked for this summer. That leaves events like NAMM with the burden of bringing badly-needed revenue to the city. More strikingly, the show and its exhibitors are working with ongoing efforts to assist local musicians and studios in recovering their lost possessions and livelihoods in the wake of the floods. Efforts for flood relief were a prominent feature of the NAMM show. Nashville electronic musician Tony Gerber [artist site @ reverbnation] is a direct recipient of such aid. Gerber is a solo artist, member of space music ensemble Spacecraft, and active in the music performance scene in Second Life as Cypress Rosewood. He’s had his music life put on hold after the flood, losing approximately 80% of his and his family’s possessions. Despite those losses, he sees the ordeal as a “positive experience,” largely due to the assistance of friends, fellow area musicians organizing a benefit concert in his behalf, and the Recording Academy-associated relief organization MusiCares. 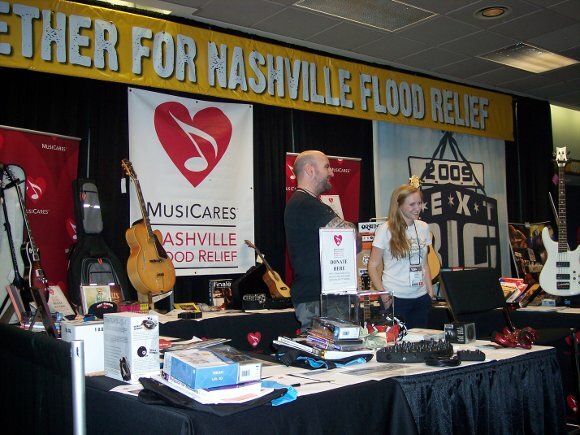 While MusiCares provides aid to individuals in the music industry during many types of crises, they acted quickly to establish an active presence in Nashville’s music community, offering expedited financial aid to cover losses. They also partnered with retailer Guitar Center to collect equipment donations at their stores nationwide and to offer discounted prices on replacement gear to flood victims. While details are kept confidential, MusiCares staff member Courtney Bailey said that they had given out approximately $250,000 to flood victims since their establishment. Despite the flood and despite the economy, retailers and buyers still came to Summer NAMM 2010 to do business. It’s unclear at this point whether we’re experiencing a few bad years or a downward trend that could change the way the music manufacturing industry operates. We may be able to tell more from Winter NAMM, where manufacturers customarily pull out the big guns. Until then, Nashville restocks, refinishes, repairs, and rebuilds. Contributor Jeremy Dickens is a native Nashvillian musician, engineer, sound designer and and producer with works on dPulse Recordings, Sony Digital and his own Discrepancy Recordings imprint.